We met in 1976. We were both at a two-week, teller-training program at United Virginia Bank. I had graduated from college and gone to France for a year, and when I came back I moved to Richmond. Rosemary had just quit nursing school at the University of Virginia. Climbing out of the teller pool created a bond between us: after a few months working as a teller she went back to school in business at the Virginia Commonwealth University and several months later I went there to become an accountant. In January of 1980, she moved to Pittsburgh and I went to Roanoke for work. Our three years in Richmond were the only years we lived within 150 miles of each other. We were both talkers and liked to hash things out. In Richmond, I’d go over to her home — she lived with her parents and her older sister — and her sister would say, “Why don’t you go out to a bar?” And we’d look at her like she was speaking a foreign language. We didn’t need to go to a bar! We could talk right there. We liked many of the same things as far as movies, theatre and going out to eat. With girlfriends — unlike maybe husbands, boyfriends and possibly parents — saying “I love you” was not common. But when I had a miscarriage at the age of 39 that was the first time — and I think the only time — that Rosemary said that she loved me. I never told her I loved her and now I will never be able to. I didn’t get married until I was 38 and, three years later, Rosemary married at 40. Singlehood was a strong bond between us for half of our friendship. 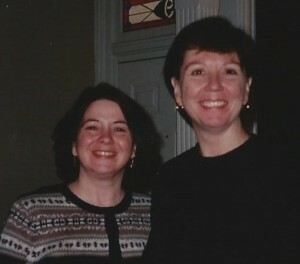 It gave us time for each other even though we lived apart from 1980 until she died in 2009. Our friendship existed in many, many telephone calls, letters, emails and visits to see each other in our far-flung, changing residences. Rosemary was famous for saying, “Ninety-six percent of people get married, I don’t want be part of the four percent who don’t get married.” One time we both drove to Hilton Head, me from Roanoke, her from Richmond, and we sat there at this beautiful restaurant looking at each other saying, “I wish it wasn’t you here, I wish you were my husband.” But I think we were quite happy to have the other one over there in that other chair. In many respects, getting married didn’t change the tenor of our relationship. Our husbands weren’t friends and we didn’t have a relationship as couples. It would have been different if we had been living in the same town and all of a sudden the dinners or the movies or whatever ended. But our relationship continued on as it had before marriage. We were mirrors for each other. We just talked and talked and talked about anything. My husband was a little more action-oriented in his thinking. I mean, he was wonderful, but I had to push him about four or five times for the advice or the type of conversation I was looking for. I think a good girl friend is a savior to a good marriage because you’re not burdening that marriage with all the little intricacies that I as a woman – I don’t want to say every woman – I like to ponder. Rosemary was the same way. Friends do not have the expectations that we have with a spouse or parent. If Rosemary left towels on the floor when we in a hotel together it was only for a short time, but my husband, he left the towel on the floor every dang day. Rosemary eventually went into social work. She was definitely in the listening role quite often. She was always there for me. And to this day, when I mess up, it’s Rosemary who I want to call and tell. I don’t have those thoughts as regularly about my mother and my husband. My husband and mother had different expectations of me. Rosemary only had love and friendship. I could call her at any time – although I don’t think I ever exercised that 3 a.m. option – and she would commiserate with me. I considered her my sister from another mother. I miss her more than I miss my husband and mother. Back in 1985, some friends were supposed to go visit Rosemary in Atlanta, but she wasn’t answering their calls to make final travel arrangements. They eventually called her work and found out that she hadn’t been in for a few days. The police broke into her apartment and took her to the ICU. She was there in critical condition for some time. While she was in the hospital, her sister said something like, “Well, considering what she tried to do to herself, I am not surprised at her condition.” I went to visit after she was out of the hospital, but she never said a word about what happened, and I never asked. When my husband was dying at Sloan-Kettering, Rosemary and I were at a hotel room in Manhattan. I asked her one night when the lights were out, “Rosemary your sister told me that you tried to commit suicide back in 1985” and Rosemary did not respond. I do not know if that was the last question of the night or whether we moved on and talked about something else. I am thinking right now, could she have fallen asleep and not heard me? I never even questioned that she fell asleep and didn’t hear me until just this moment. But I’m assuming she heard me. Rosemary died May 11, 2009. I knew she’d been in the hospital in Charlottesville in late April. She had told me that she was just exhausted and I knew her work was very demanding and so I just accepted that that was what it was. My daughter was in ninth grade and was having a little trouble. I was distraught and I called Rosemary from a hotel room near my daughter’s boarding school in Connecticut. Rosemary wasn’t there, so I left a message. The next day, I got a phone call back from her husband saying that she had died that Monday. He said she died of gastroparesis. I thought that was an odd thing for her to die of. I knew of the recent diagnosis and I knew she was nowhere near a final stage of that disease. I went down for her memorial service and not a thing was mentioned. I stayed with a friend of hers there and that friend just happened to bring up maybe it was a suicide. But I considered that was just pondering. A year or so later, maybe two years later, I was talking to a girlfriend of hers who said. “Yes, her husband finally told me it was suicide.” It was weird because everybody kept that from me. I don’t know why and I also have no idea why Rosemary would not have shared her pain with me. I had already been through the loss of my husband in 2004 and the loss of my mother in 2008 so when Rosemary’s husband called and said she was gone it was like okay, here’s another one. I’ll just move through it and put the grief aside. But the grief over her has just continued to unfold every day that she is not here. I’ve learned that loss is forever, especially as I’ve gotten older because she and I would always talk about how we’d live together in the old folks home. I’ll miss her then too. I was looking forward to that. Since she died I’m more isolated. That’s why I’m taking a resilience class right now. The fact that I had that kind of friend for 33 years still warms me to this day. She’s not here, but she still is in my life. I definitely talk with her at times when I need the comfort of talking to her. A best friend supported me in that way that food and water support me. My husband also supported me, but he was more like dessert. You can live without dessert, but you can’t do without food and water. My husband and I had only known each other for thirteen years when he died, whereas Rosemary and I were friends for 33 years. I just re-joined a music group that I used to play with. Their response to me coming back was so wonderful and warm. I was so happy! I wanted to tell somebody just how excited I was and Rosemary was the one I wanted to tell. I thought, “I have people I can call when I’m sad, but I don’t really have anybody right now that I can call and share great happiness with.” Could I ever have another best friend? I’d have to say no, not like Rosemary. I’ve not met that kind of friend. I have other good friends, but none like Rosemary. Before Friendship Dialogues was a gleam in founder Ellen Pearlman’s eyes, a group of over two dozen women answered her online plea for women who had lost a female best friend. Ellen is eternally grateful to all the women, including Kathy, for opening their hearts to her and sharing their personal stories of love and loss. It was through this process that the seeds for Friendship Dialogues were planted. Thank you!